revised, and then, two months after the initial estimate, they’re revised one last time. Mostly, though, only the first estimate ever gets much attention. In one sense this doesn’t matter. 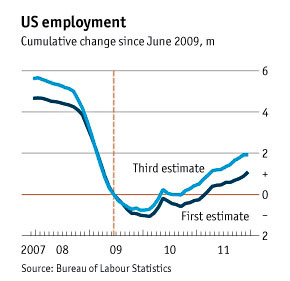 Both lines show that we’re about 3.5 million jobs below the previous peak. And neither line shows much acceleration in the jobs picture over the past year. Still, while this chart shouldn’t change our minds a lot about how well the economy has been doing recently, it does suggest there’s a little more cause for optimism than the headline numbers have suggested in real time.